The Christmas fun is about to begin and it is important for all pet owners to be aware of some common dangers that could put their pet in danger during festive celebrations. Follow these 5 safety tips from Dr Mark to make sure you and your pet enjoy the holiday season! Turkey stuffing with onions and garlic contains the chemical thiosulphate. This chemical can cause your pet's red blood cells to weaken and rupture. Turkey and ham bones need to be kept far out of reach from all pets. These bones can splinter and lodge in an animal’s throat or intestine as well as cause severe constipation. Place your Christmas tree in a position that won’t be of risk to your pet. Make sure they are not able to knock it over or chew on any Christmas light cables. Christmas decorations can be a serious hazard for your pets’ wellbeing. Many people like a tipple during the festive season but remember that alcohol should be strictly kept in the hands of humans. Dogs and cats are much smaller than people, and so are much more susceptible to the poisonous effects of alcohol. Gift wrappings can be dangerous to your pet’s health. String and ribbon can cause obstruction of the small bowel if swallowed. 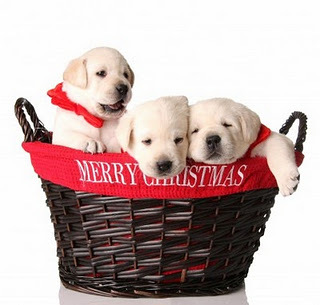 Merry Christmas to all our wonderful pets!